The first comprehensive English translation and commentary on Dante's early verse to be published in almost fifty years, Dante's Lyric Poetry includes all of the poems written by the young Dante Alighieri between c. 1283 and c. 1292. Introductory es-says by Teodolinda Barolini guide the reader through the new verse translations by Richard Lansing, illuminating Dante's transformation from a young courtly poet into the writer of the vast and visionary Commedia. 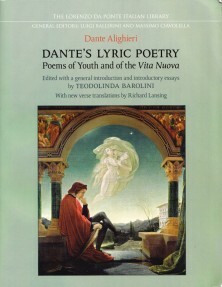 Barolini argues that Dante's lyric poems are early articulations of many of the ideas and themes in the Commedia, including the philosophy and psychology of desire and its role as motor of all human activity, the quest for vision and transcen-dence, the search for justice on earth, and the transgression of boundaries in society and in poetry. With splendid new English translations and commentary, this edition brings Dante's early poems to a wider audience, while providing important literary and historical context. RICHARD LANSING is a Professor Emeritus of Italian Studies and Comparative Lit-erature at Brandeis University.